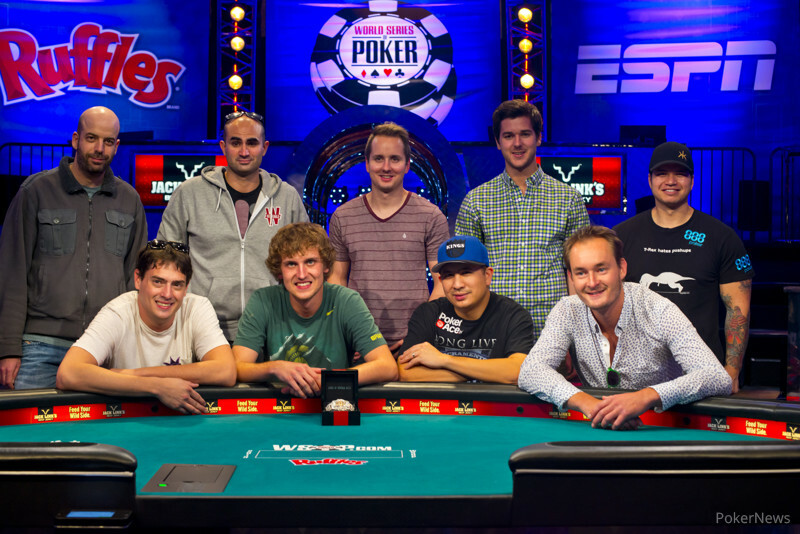 The 2013 World Series of Poker Main Event has reached this year's November Nine. At noon on Friday, 27 players remained for Day 7, but that has since been whittled down to just one third of that field. The man who bagged up the chip lead for the four-month hiatus was two-time WSOP gold bracelet winner JC Tran. Joining Tran to play for poker's greatest prize are Amir Lehavot, Marc McLaughlin, Jay Farber, Ryan Riess, Sylvain Loosli, Michiel Brummelhuis, Mark Newhouse and David Benefield. 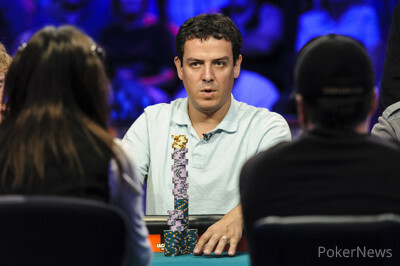 Benjamin Pollak was the first player eliminated on the day, falling in 27th place. From there, Jorn Walthaus and Jason Mann headed out the door, then it was time for Steve Gee's amazing back-to-back run to come to an end. After making last year's WSOP Main Event final table and placing ninth, Gee took 24th this year. After Gee, Clement Tripodi, Yevgeniy Timoshenko and Maxx Coleman fell, a huge shocker occurred with the elimination of start-of-the-day chip leader Anton Morgenstern. Despite beginning the day with a big lead and nearly 22 million in chips, Morgenstern busted in 20th place. Not much seemed to go his way throughout Day 7, including a big clash with Newhouse when he flopped trip aces to Newhouse's full house. Then, James Alexander then finished in 20th place, James Alexander in 19th, Jan Nakladal in 18th, Fabian Ortiz in 17th, Chris Lindh in 16th, Bruno Kawauti in 15th, Sergio Castelluccio in 14th and Alexander Livingston in 13th. At this point, two tables of six remained. Then, two-time WSOP gold bracelet winner Rep Porter was sent off in 12th place by Riess. Following Matthew Reed's elimination in 11th place, the final 10 players redrew to one table on the ESPN main stage where the plan was to lose one more. JC Tran had a big chip lead, and Newhouse took his seat at a severe short stack with just six big blinds. Luckily for the latter, he was able to find an early double up through Loosli. Newhouse then three-bet shoved a couple of times to pick up some more chips and get himself out of the basement. The biggest story remaining when the unofficial final table was reached was that of Carlos Mortensen, who was looking to become a two-time champion of this event after having won it back in 2001. As it turns out, Mortensen would finish as the 10th-place finish and bubble the famed November Nine. Mortensen was knocked back a couple of times as opponents shoved on him. With the additional beatings taken from the blinds and antes, Mortensen slipped to the shortest stack remaining. Then, he was eliminated by Tran. On the final hand, Mortensen raised to 800,000 from the cutoff seat, and Tran called out of the big blind. The flop came down , and Tran check-called a bet of 800,000 from Mortensen. The turn was the , and Tran moved all in, having Mortensen covered. With a little over 3.5 million left in his stack, Mortensen called. Mortensen tabled the for a pair and a flush draw. Tran held the for a straight to the ten. Needing any club but the on the river, Mortensen was looking to hit a flush and double up. If not, the night would be over. In the end, it was the that hit the felt and that was that. Mortensen was eliminated in 10th place, taking home $573,204, while the other nine players rejoiced as they have reached the greatest final table in the world. On behalf of PokerNews and the WSOP, we would like to thank everyone for following along all summer long. 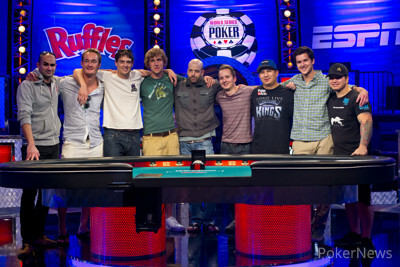 Plenty of history was made once again, and the 2013 WSOP will surely be one to remember. For now, this is our final good night from Las Vegas for the summer, but we'll see you right back here in early November for the conclusion of this spectacular event. Thanks for following along! Hand #280: Marc McLaughlin received a walk in the big blind. Hand #281: Carlos Mortensen raised to 800,000 in the cutoff and JC Tran called from the big blind. The flop came down and Tran check-called 800,000 from Mortensen to see the turn. Tran shoved for about 3.625 million effective and after a few seconds, Mortensen called for his tournament life. Tran pulled ahead on the turn with a straight, while Mortensen needed a club to survive. Mortensen was unable to hit the club, ending the 2001 Main Event champion's bid for another Main Event final table in 10th place. Hand #278: JC Tran raised to 850,000 from middle position, winning the blinds and antes. Hand #279: Carlos Mortensen completed from the small blind, Amir Lehavot raised to 925,000 from the big blind, and Mortsen snap-called. The flop fell , Mortensen checked, Lehavot fired out 850,000, and Mortensen folded. Hand #277: Carlos Mortensen raised to 1 million from under the gun and action folded to Ryan Riess in the big blind. After about 45 seconds, Riess reraised all in for 7.7 million effective. Mortensen gave it some thought, but folded. Hand #275: JC Tran raised to 850,000 in the hijack seat, winning the blinds and antes. Hand #276: Tran opened to 850,000 from middle position, and the action folded to Mark Newhouse, who moved all in for 6.25 million from the big blind. Tran snap-folded. Hand #273: Ryan Riess raised to 800,000 from middle position and JC Tran called on the button. The flop came down and Riess continued for 950,000. Tran called, the hit the turn, and Riess bet 1.65 million. Tran mulled it over briefly before he folded. Hand #274: Marc McLaughlin raised to 850,000 from the hijack and took down the pot. Hand #271: Sylvain Loosli raised to 800,000 from middle position, JC Tran defended his big blind, and the flop fell . Tran checked, Loosli continued for 950,000, and Tran folded. 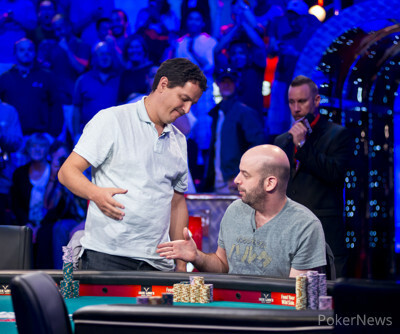 Hand #272: Jay Farber raised to 825,000 from under the gun, Ryan Riess called in middle position, and the pair took a flop of . Farber continued for 1,350,000, and Riess folded. Hand #270: JC Tran raised to 850,000 from under the gun, Jay Farber called from early position, and Carlos Mortensen called on the button. The flop fell and Tran continued for 1,525,000. Farber and Mortensen both called, the hit the turn, and Tran fired 3,150,000. Farber called, while Mortensen opted to duck out of the way. The river completed the board and Tran took about 60 seconds before he checked. Farber checked behind and Tran tabled for a pair of queens. Interview with David Benefield: "It's Every Poker Player’s Dream to Make the Final Table of the WSOP Main Event"
Interview with JC Tran: "It’s All About Image"